Dear Customers, we are pleased to indicate opportune ways to go to reach our hotel without any unpleasant fines due to the closing of the gates of the Limited Traffic Zone established by our municipality. In the picture above you can see the detail of the latest ways to go to reach our hotel without any problem. To the roundabout between Avenue of the Fosse Way Brigade and Basilicata and into the Avenue of the Martyrs. Take the Avenue of Martyrs and the descent of Margnan right and then turn left on Via Bonamigo, you will find a sign indicating the turn with Hotel wrote to the Castle. Shortly thereafter over the short climb to the right you will be in and arrived at our hotel at the Castle. Exit the parking of the Hotel along the descent of Margnan the left, turn right in Via Sant’Anna, then right again make the climb of Via Santa Caterina, you get to Round from which you can choose the desired directions. 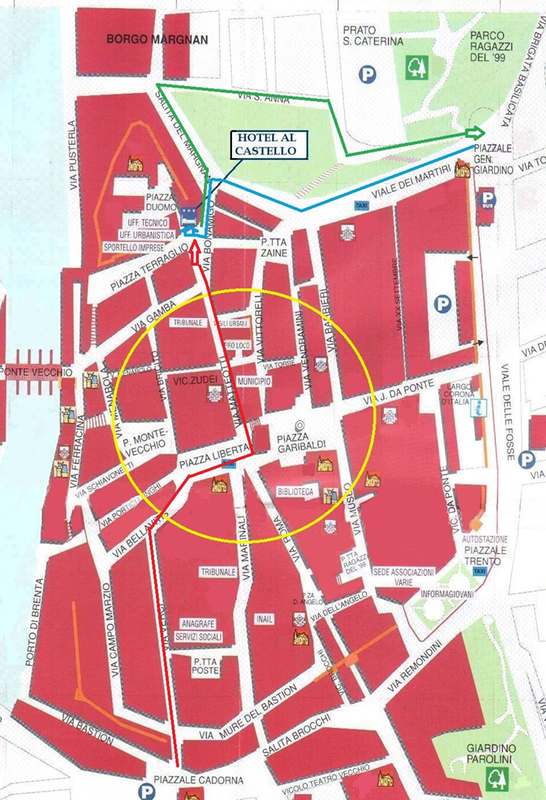 The direction RED can ‘only be used when the LTZ (yellow area) and not’ active can get to the hotel through the old town but this and ‘possible only when the LTZ is not’ active . …pay close attention to the gates of the LTZ, it is crossed only if the traffic lights and ‘green if the traffic light is red do not cross the center will be filmed and fined so use only in this case directions green or blue alternatives.